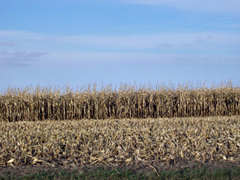 Partially harvested corn field in northwest Iowa. Iowa farmers got a good week of warm weather to catch up on the harvest — but that warm weather also had a downside. Mold toxin has grown on some of the corn, and ethanol plants are rejecting the corn. Iowa State University grain quality specialist Charles Herberg says mold toxin is always in corn fields. Herberg says this year corn has been in the fields a long time, and he says the warm weather brought on some increased mold. The mold toxin gets concentrated in the mash byproduct from ethanol that is sold for livestock feed. That contaminates the feed, which lead to hogs refusing it and, if hogs do eat the contaminated feed, it causes them to abort their young. As for the harvest, Monticello farmer Randy Toenjes says the warm weather helped. He says they are in excellent shape in Jones County. Toenjes says they were able to make good progress with the dry weather. Toenjes says they are about 75% done with the corn and the bean harvest was wrapped up one week ago. Toenjes is ahead of the average for both corn and beans as the latest U.S.D.A. crop report shows 96% of Iowa’s soybean crop is harvested, while only 59% of the corn crop is in the bin. The bean harvest is still 12 days behind the five-year average and the corn harvest is 17 days behind the five-year average.